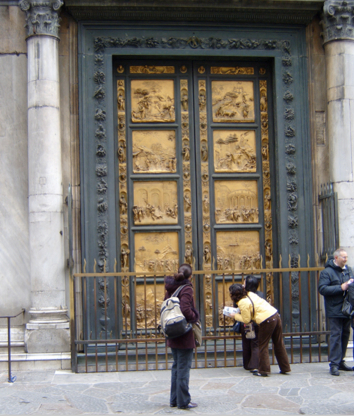 On September 8, 2012, Lorenzo Ghiberti’s Renaissance masterpiece “The Gates of Paradise” was once again available for public viewing after 27 years of restoration—but not its original home, Florence’s Baptistery. Instead, these two massive gilt doors, which depict ten scenes from the Old Testament, are now enclosed in a protective case in Florence’s Duomo Museum. Art lovers around the world may wonder: Can the copy of a masterpiece move us like the original? Must we see it where its creator intended? 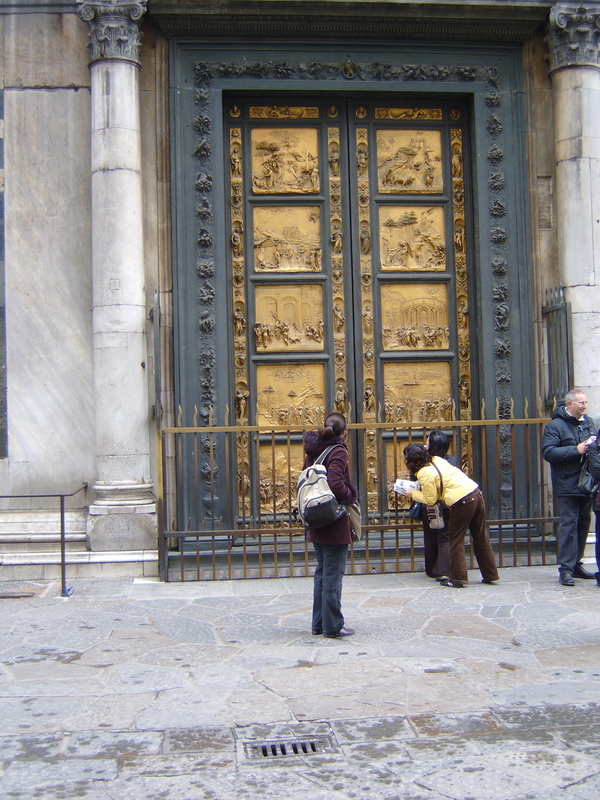 No stranger to dislocation, Ghiberti’s “Gates” has elicited such questions for a long time. During World War II, the doors moved to safety, only to be damaged in peacetime during Florence’s great flood of 1966. Slower, equally corrosive enemies followed the Arno’s waters: pollution in Florence, which only recently banned unauthorized vehicles from its crowded center; fluctuations in humidity, which caused the interior bronze to damage the gold surface. The transfer of Ghiberti’s “Gates” from its natural habitat to an artificial, protected one follows a general trend. In Florence and throughout Italy, masterpieces are often tucked away in museums, while their copies stand undefended and vulnerable in the original sites. The most celebrated sculpture in Florence if not all of Italy, Michelangelo’s David, stood in the Piazza Signoria from 1504 to 1873, when it was moved to the Accademia to save it from acts of vandalism (albeit unsuccessfully: in 1991, a deranged man attacked the David with a hammer, breaking off the left foot). Meanwhile, copies of the David occupy some of the most exquisite real estate in Florence: the original site of the statute at the entrance to city hall, and a perch across the Arno where tourists enjoy breathtaking views. The German philosopher Walter Benjamin developed the influential theory that original works of art contain an “aura” that even an exact replica forever lacks. This aura refers to the work’s existence as the product of a specific time and place. No reproduction, no matter how skilled or convincing, can capture that original moment and context of creation. Benjamin brilliantly intuited that, once we begin to reproduce works of art and display them as copies in new venues, we open the door to politicizing these works and manipulating their social impact. This question was hardly abstract: Benjamin wrote his essay on artistic reproduction in the 1930s, when extremist groups like the Fascists and Nazis used mass aesthetic spectacles to seduce the public. Of course, Florentine officials moved Ghiberti’s “Gates” out of brutal necessity rather than any pernicious political motive. The museum that houses the fragile panels provide a controlled haven, while placing them alongside other artistic marvels. But something will be lost in this flight to safety. The word “aura” comes from the Latin for gold, and in this sense we can think of the original work as having a shine or brilliance that cannot be replicated. Part of the luster comes not just from the work itself but also from its relation to the outside world. When Ghiberti’s doors decorated the Baptistery, they separated the city streets, with their mix of nature and commerce, from the womb of a holy site and cultural shrine. Strolling past the newly sequestered “Gates” can never compare with gazing at them under the sun or rain, as part of a walk through living, breathing Florence, just after an espresso and a brioche at a local bar. But then again, I only experienced this “natural encounter” too long ago to remember the details, when I first went to study art in Florence as an undergraduate in the late 1980s. Ghiberti’s doors were removed for restoration in 1990, so any sun or rain that accompanied my subsequent visits did so while I stood before a copy. Nonetheless, Ghiberti has continuously inspired me for over twenty years. If done correctly, the reproduction or relocation of a work of art signals not its defeat, but its translation, in its original meaning as “carrying something across,” an essential element in a work’s preservation and dissemination. The transfer of Ghiberti’s fragile “Gates” enables us to enjoy it for centuries ahead. Rather than lament the masterpiece’s relocation, better to embrace its new split identity, as a site-neutral original and a site-natural copy. These two new forms may lack the aura of Ghiberti’s original Baptistery doors, but they can suggest the paradise beyond them nonetheless. You can learn more about the “Gates” here. This entry was posted in General and tagged Arno River, art restoration, aura, Duomo, Florence Flood 1966, Gates of Paradise, Ghiberti, Joseph Luzzi, Michelangelo, Piazza Signoria, Renaissance, The David, Walter Benjamin by josephluzzi. Bookmark the permalink.